Nova Scotia once ruled the waves in the world of sailing ships. 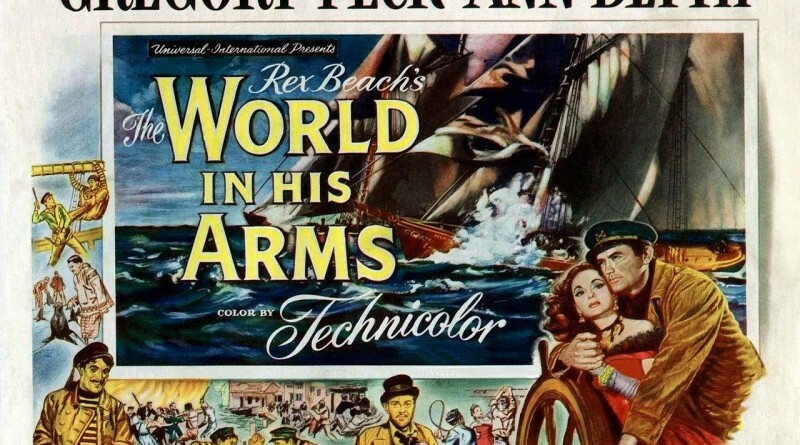 So much so, in fact, that Hollywood came calling in the early 1950s for our help in the making of a swashbuckling classic starring Gregory Peck, Ann Blyth, and Anthony Quinn, directed by the great action helmer Raoul Walsh and adapted from a Rex Beach novel. At the heart of The World In His Arms was an edge-of-your seat schooner race from San Francisco to the Pribilof Islands off Alaska, led of course by the two captains played by Peck and Quinn. The race was actually shot off of Nova Scotia rather than California. The two vessels were commandeered from Lunenburg’s fleet and each crewed by 22 men. Shooting for 50 days, the second unit, led by filmmaker James C. Havens (who specialized in shooting at sea), expertly constructed the sea-bound duel with Peck and Quinn that was mixed in later with Studio-filmed shots. The story included Peck’s first mate, a Nova Scotian who even concocted a Bluenose-style Ceilidh complete with fiddles, accordions and lively step-dancers for one of the lighter ensemble moments in the movie. The film – a follow up by Universal Studios for their big 1951 hit Captain Horatio Hornblower R.N. – made three million dollars at the box office and confirmed Peck’s status as one of the world’s most famous male actor for his time. The World In His Arms is a heady reminder of when Nova Scotia was known around the world for its sea-going expertise. You can detect the shoreline of the province in a number of shots, and the overall landscape certainly doesn’t look like California or Alaska. The world premiere of the film took place on June 18th, 1952 in Anchorage, Alaska, the first time Hollywood had opened a film in what was then still a U.S. territory. The question of whether Alaskans, or even New Yorkers who saw the film at its Big Apple Premiere that October 9th, could distinguish the Nova Scotian influence is one that, alas, seems never to have been addressed. Considering a 50-day shoot was 10 days beyond the standard 40-day feature production schedule of the time speaks to the care and influence of the Nova Scotia content of the picture. It also directly takes aim at something we did where we were, indeed, the unquestioned masters of the schooner sailing idiom. Remembering our proximity to the sea and our unique relationship to the oceans that surround us is makes up a crucial part of our identity. The World In His Arms offers us proof that others recognized that too.